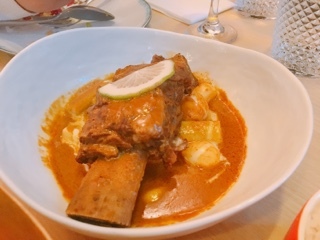 Although my love for Thai noodle dishes will never wane – cold, stir fried, smothered in a coconut broth, or engulfed in a fiery tom yum – it’s a pleasure to see Chef Nuit and Jeff Regular’s newest restaurant, Kiin, introducing Toronto to more refined Thai dishes, especially Royal Thai cuisine. The difference is evident as soon as you enter the restaurant, the dining room is light and airy with plenty of empty space between the bar and tables. Gone are high-top tables and backless chairs of Pai and in its place plush banquette seats and chairs that hug around you. The vision of Chef Nuit, Kiin’s environment is pretty and serene, inviting guests to relax and take things down an octave. 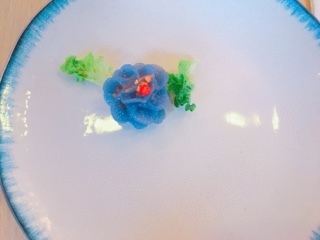 Even the dishes have a surreal artistic quality to them; the age old saying of eating with your eyes first is certainly evident here. 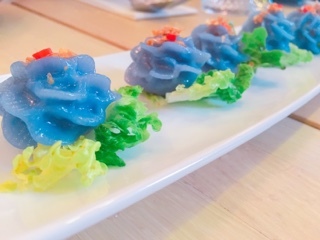 The chor ladda’s ($12) chewy jasmine rice wrapper is naturally coloured with butterfly pea, an ingredient common in Thailand that’s spreading to the Western hemisphere. Inside each plump flower is a sweet and savoury paste of finely minced peanuts, onion, pickled radish and coconut sugar. 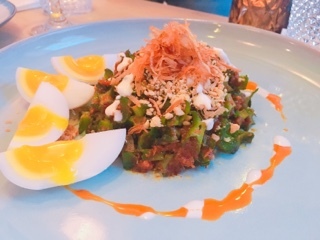 Not only do the crispy garlic, bird’s eye chili, and baby romaine garnishes complete the floral look, they also augment the flavours and textures of the chor ladda. In Thailand, describing a dish as a salad, just means it’s tossed. 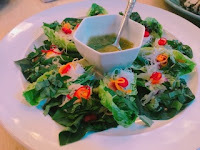 The yum tua plu ($15) puts the North American leafy greens to shame with a base of diced crispy blanched wing beans, which is like a cross between green beans and an Anaheim pepper. The chili shrimp paste adds a fair amount of heat, while the toasted coconut and peanuts a lovely rich crunch. Of all the dishes, this was the spiciest; yet the dishes at Kiin aren’t overly hot and well balanced so if you prefer a medium chili level it’s perfect. 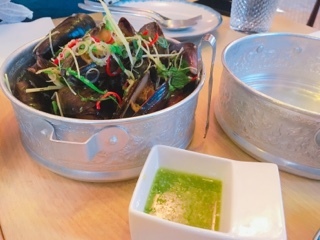 The hoi nung ta krai ($14) arrives in a gorgeous silver tiffin container, one layer holding the mussels and the other for the empty shells. The seafood is steamed in a simple mild broth, most of the flavours coming from the zippy lemongrass, lime, and garlic sauce on the side, which gives them a refreshing quality. On a hot day, a container of these with a cold glass of beer or wine would be heavenly. Having had a taste of Chef Nuit’s pork jowl at the Destination Thailand media event, I knew the kang mo yang nam jjim jaew ($15) would be delicious. 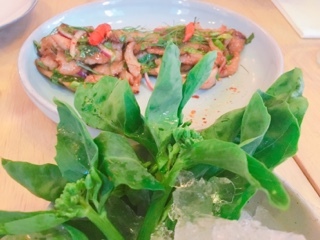 The slices of grilled meat are well marinated in sour tamarind and roasted red chili, but then further augmented by being tossed with mint, roasted rice, and vegetables. We’re instructed to have the hot meat followed by a bite of the cold Thai kale stalk. Dutifully, I follow instructions, but find the mouthful of plain broccoli like vegetable underwhelming. Personally, I’d rather pick the leaves off and wrap the pork jowl, vegetables, and kale stalks into them like ssam. Jeff advises that most of their ingredients are important from Thailand, even the produce to ensure they’re fresh and the real deal: the garlic is Thai garlic, lemongrass is fresh, and the fruits rarely found in other establishments. 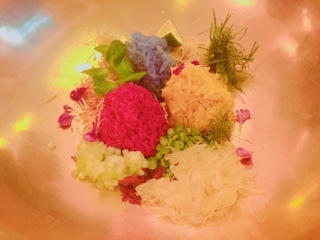 A dish that showcases all these ingredients is the khao yum ($24), which arrives as three piles of coloured rice (a yellow turmeric, red beet juice, and blue butterfly pea), before being tossed with diced beans, coriander, lime leaves, toasted coconut, pomelo, fried chili, sprouts, lemongrass, and edible flowers. The khao yum could use more of the tamarind and soy bean sauce, as despite looking colourful, it was a tad bland. Overall, although gorgeous to look at, I’d rather have a bowl of coconut rice any day ($5). A bowl of this aromatic grain comes with the gaeng boombai nua ($28), a bone in beef short rib smothered in a fantastic tamarind gravy. Along with the fragrant coconut rice, it’s so satisfying that each bite made me instantly want more. Oh why didn’t we order two of these for our table of four?! Don’t make the same mistake we did. Meanwhile, the mieng pla ($32) is great for larger groups. 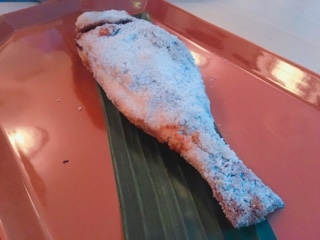 A whole salt-crusted sea bream is displayed at the table before being brought back to the kitchen and fileted (be careful, we still found numerous larger bones left in the fish). 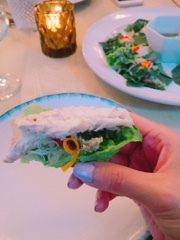 The fish returns along with a platter of Thai kale leaves and baby romaine topped with vermicelli noodles, thai garlic, basil, mint, peanut, ginger, shallot and lime. 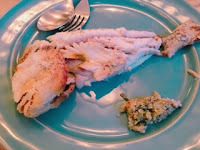 Having been salt-crusted, the fish itself is flavourful, but there’s also a citrusy chili vinaigrette to add even more taste to the dish. One can only imagine all the preparation and time it takes to prepare the mieng pla – crusting the fish, baking it, preparing all the ingredients for the wraps, assembling the wraps, fileting the fish, and making the sauce. Everything arrives ready to add a piece of fish and eat. The use of intricate techniques and fresh vibrant ingredients is what makes Royal Thai cuisine so special. All the time it takes to perfect and create a dish is also why you rarely find restaurants willing to serve the fare. Although it sounds corny, you can taste the care that goes into each dish. During our visit, Chef Nuit and Jeff Regular were both at the restaurant: Jeff visiting tables to explain dishes, while Chef Nuit making a couple of brief appearances from behind the kitchen. The Regulars have brought something special to Toronto with the opening of Kiin. To them: khob khun mark ka and krab.